The news was confirmed this morning on his Facebook page. MUSICIAN LEONARD COHEN has died, aged 82. The world-famous musician’s death was confirmed early this morning on his official Facebook page. “It is with profound sorrow we report that legendary poet, songwriter and artist, Leonard Cohen has passed away,” the post reads. The post goes on to say that a memorial service will be held in Cohen’s honour at a later date. 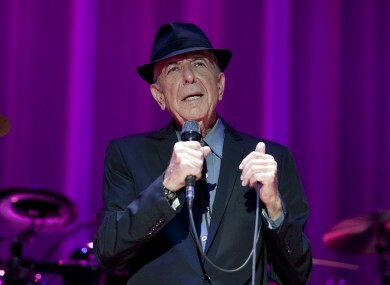 A Canadian by birth, Cohen rose to fame in the late-60s with his first album Songs of Leonard Cohen. This album contained such well-known songs such as Suzanne, So long, Marianne, and Hey, That’s No Way to Say Goodbye. Cohen went on to pen many other highly influential and well-known songs such as Hallelujah, Bird On A Wire and Sisters of Mercy. A published poet and novelist, Cohen created lyrically deep and complex songs and melodies which struck a chord with generations of fans across the globe. I am ready to die. I hope it’s not too uncomfortable. That’s about it for me. A prolific songwriter, Cohen released his 14th studio album You Want It Darker just three weeks ago on 21 October to wide critical praise. The album dealt with themes of mortality, love and death and was Cohen’s final musical output to the world. Well Marianne, it’s come to this time when we are really so old and our bodies are falling apart and I think I will follow you very soon. Know that I am so close behind you that if you stretch out your hand, I think you can reach mine. Email “Musician Leonard Cohen has died aged 82”. Feedback on “Musician Leonard Cohen has died aged 82”.